This is one of the most novel ways ever devised for doing both mental and card effects. Devin Knight shows you how to buy a gumball machine bank and gimmick it in a few minutes to allow for some of the most baffling poker demonstrations and card effects ever devised. These are regular gumball banks that sell in toy stores for around $10 to $20. Gumballs are marked with card values from A to K using a fine-tip Sharpie. Once this is done, you have everything you need to create miracles. A spectator shuffles cards. Either the magician or the spectator deals out 3 poker hands face down. Spectator is given a free choice of any hand (NO FORCE OF ANY KIND). He then turns the hand over and is asked to play by discarding any card (as he would in draw poker). Magician states that instead of the deck, the person will put a quarter in the gumball machine, and the value on the gumball will be his HOLE CARD. He asks the spectator what would be the best card he could get. Say the spectator says "four". He puts a quarter in the machine and turns it, and out comes a gumball with a 4 on it, giving him the winning hand he needs! IMMEDIATELY you gather the cards and deal 3 more poker hands. The person is AGAIN given a free choice of any hand to play, discards what he doesn't want, and once again inserts a quarter into the gumball machine. Yes, the value on the gumball that comes out is what he needs the most to have the best winning hand possible! Magician never touches the gumball machine during the trick, and the selection of what hand to play is a totally FREE choice with NO FORCES of any kind. 1 - Spectator gathers up the cards and shuffles them. The magician NEVER TOUCHES the cards at any time. The person selects a card (no force of any kind) while the deck is in their hand. He then cuts and lose the card in the deck. Magician asks the person the total of the values on the two gumballs that came out at random. Say they total 12. The person counts down 12 cards and there is the very card he selected! Magician NEVER touches the cards. The spectator turns over the card he selected and it matches the card in the envelope. He removes the card, not you. No switches, no extra cards in the deck. Once again this will fry seasoned magicians. 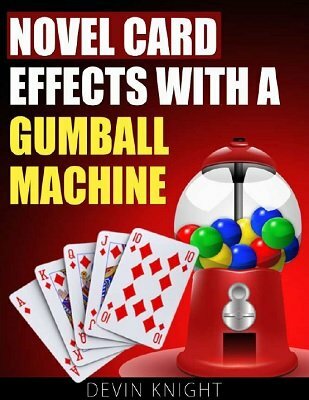 Many other effects are explained using only cards and gumballs. A person names a two-digit number and inserts two quarters into the machine.Two gumballs come out with the same number. Devin gives you a fool proof method that is 100% surefire. 1st edition 2013, 21 pages.